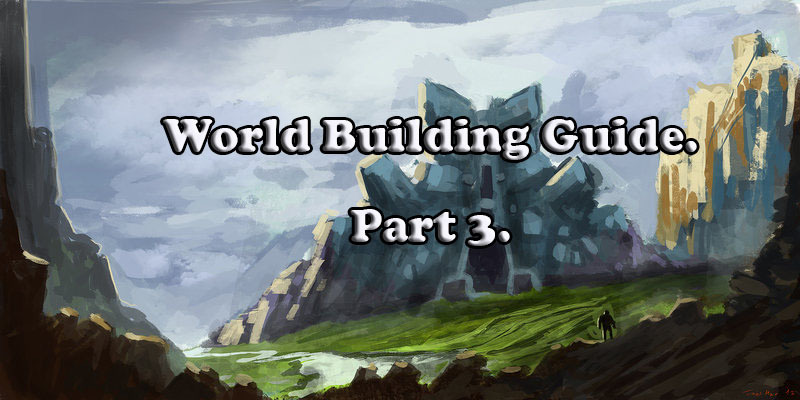 World Building Guide. Part 3. 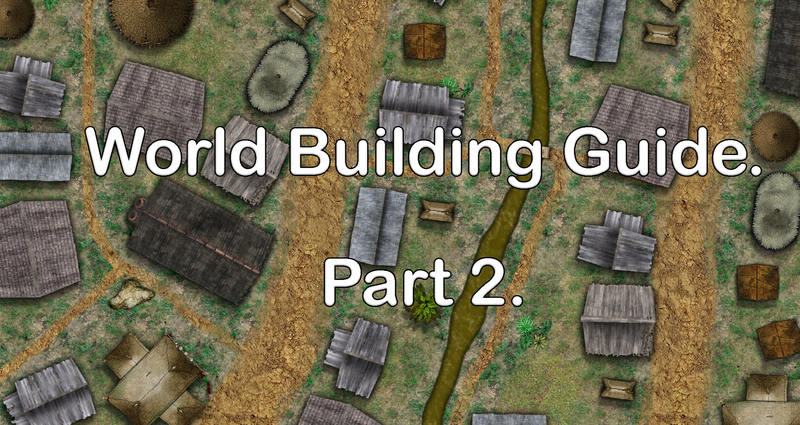 We have previously discussed how to begin putting a world together, and how to build the structure of your first town or village. We also looked at building your Non Player Characters in that settlement as well as their relationships with each other. It is important to not only build the relationships between people, but also between places. Once you have a single village (like Newton) developed, it will need some other places in the surrounding area for it and its inhabitants to interact with. Now it is time to make Newton, the forest it is close to and the portion of the river it sits upon part of a wider area or region. Much like we have counties or Parishes in our world, your world will benefit from similar borders or boundaries to define areas. I do not want my first region to be too big, so I am going to make it about one hundred and twenty miles from east to west, and about one hundred miles north to south. This way it can be crossed within a week by most people. It gives me a large enough area to have several other settlements, as well as a few places of interest for my players to explore. Let us go back to Newton and make a few more decisions. We already decided that an average days travel for the folk in this area (being as horse and cart would be the standard medium of travel) is Fifteen to twenty miles. This is also the base distance we used when figuring out how large to make the region. We decided that a town is just within a days travel of Newton, so I would begin by creating and building that town. I decide to place it West (along the road). I develop this town in the same way I did Newton. We will call this town Heraford. Once I have completed it and created all the internal structures and relationships, it is time to look outwards. I now need to look at the relationship between Heraford and Newton. I begin by deciding their social view of each other, and any dependencies they may have. How would Heraford describe Newton and vice versa. Lets start by examining the two settlements. Hereford is a town of three thousand people. It is close to some hills where a prominent ore mine is established, so it is primarily a mining town. It has more advanced building structures than Newton and has a larger population by far. It has a Mayor much the same as Newton, but it has an elected council of twelve people to keep up with the politics and running of the town. It is situated on the western trade road but is closer to a large city than Newton. Newton on the other hand is a village with one hundred and twenty people. It is situated close to a forest and sits upon the bank of a river. Well Newton will rely on Heraford for ore and most of its metals. It also may benefit from some of the overflow trade that heraford may receive from the closer proximity to the city. Hereford, on the other hand, needs lumber for building and in particular for mining. It may also enjoy some of the fresh fish from the river, and game and fur from the forest. We can see that both are somewhat dependent on each other, so the odds are they would have an amiable relationship. Also as we decided the town Heraford, would have a church and that Newton would only have a shrine, It is probable that many of the villagers from Newton travel to Heraford on Sundays or at least for religious special occasions. Also the local priest in Newton probably answers to the clergy in Heraford. Several of the people that grew up in either town, will probably have met and some ultimately married, so it is also a good idea to have some of the Non Player Character bloodlines living in both locations. So as I create the Non Player Characters for Heraford, I will be referencing Newtons populous, and extending some of the families. This process will go on until I have several settlements in the region I am working on. Each settlement will be cross referenced with the others in its region, and in particular those that are closest to it. In this way we not only build an economy, but a civilized structure for life in the region. we should also then look at how each settlement is run, and decide who is over the region. Is it a local lord or a king? or does every settlement come under the jurisdiction of the city in that region? Of course some regions you may develop may be less than civilized. maybe it is a vast tundra full of nomadic tribes that war between each other, or maybe it is a vast mountain range and only has a few remote outposts. Regardless the methods described so far will allow you to develop any region. So lets assume that by now we had about ten settlements in our region. As we built them we noted features we wanted them to be near, some forests, rivers hills mountains etc. Now is the time we are going to look at those chosen features and begin to develop those. We will begin with the forest outside of Newton. Firstly how big will it be? well I want it large enough to hide a few interesting things but it can not be too large or it will engulf much of my region. about fifteen miles in either direction will suffice. Maybe also at its northern most end it butts up against the foothills to some mountains so I will be considering that too. Also the river runs through one corner of it so that too will have an impact. Well firstly we can begin by deciding what kind of trees grow in the forest. Is it a pine forest or are the trees more oak and elm etc. Next what natural creatures live in the forest. Well most certainly we will have small rodents, birds, snakes and insects. We will add bears, deer and bore to the mix and maybe even a few bobcats or mountain lions may be wandering (as the mountains are close by to the North). I do not need to add every single critter to the list, but it is important for me to examine the base natural life that inhabits my forest. The river makes it particularly viable for deer etc so that part of the forest would be great for hunting. Bear would come for the deer as would the villagers from Newton. Also bears love to fish. The temptation of the deer may be enough to draw some of the mountain lions further south than normal as well so it may not be uncommon to find those not to far away from the river. We also want to add a few additional features in the forest, such as where a few clearings may be or particularity large or old trees. With the basic forest outlined we then want to add a few special features. old ruins, caves, caverns, demi human settlements etc. Reminding myself of the size of my forest, I am going to begin by adding a cave or two in the Northern part. The forest undoubtedly rises up to the north to meet the mountains, so this would be a logical place. How deep are the caves? well one is fairly shallow and only goes in a few hundred feet. The other I decide delves way down into the mountains and even meets an underground river at some point. The first cave may be home to bears, or maybe something more exotic. The other cave however gives us some exciting options. I am going to decide to make this somewhere my players are going to want to explore, and I can develop a good dungeon or something equally as exciting here. I may also decide that towards the center of the forest there is a small grove, and maybe woodland Nymphs or Dryads may dwell there. Each of these features is subject to similar consideration as the settlements where. Why is it there? Who or what lives there? What relationship does it have to the settlements? It is important to remember these things as you develop the special features. If I decide to put a goblin settlement inside the forest or perhaps in one of the caves, it is realistic to expect conflict to have arisen with the villagers of Newton. This would change the relationship between Newton and Heraford also, as Heraford would not want Newton to be over run by goblins. The social dynamic is an important aspect to consider when world building, and one that all to few Dungeon Masters consider in enough depth to allow their world to be believable. We would continue to follow this process through out our region. Addressing the mountains, hills, forests, rivers, plains, marshes etc one by one until we have them fleshed out. Now you notice I did not go into detail about what I was going to put in my second cavern, only that I was going to make it a place that my players would want to visit. It is not important just yet to fill out all the details of each special feature, only to mark the existence of them. We need to be able to have some areas ready to adapt and grow as needed, while others we will want to have fully developed. Before we do to much with these special locations however we are going to want to develop some history for our region. 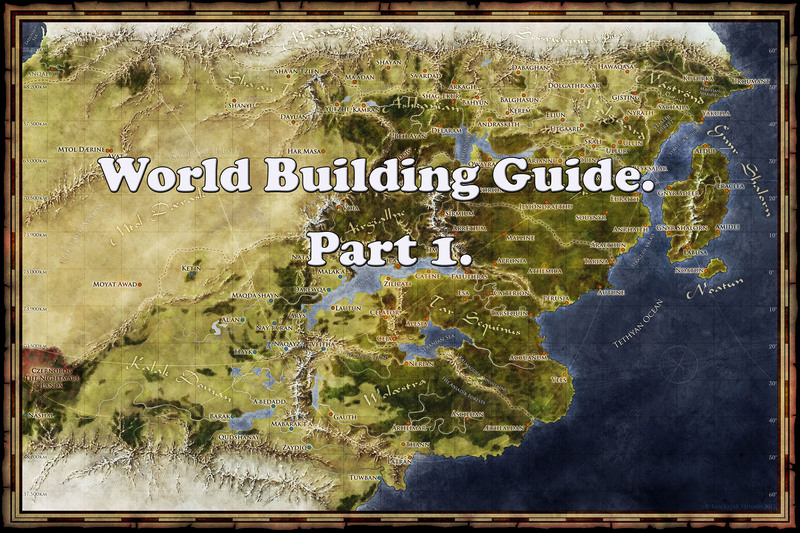 We will look at developing the history of your world, and a chronological time line in part four of this series. Puzzles and Dragons (puzzles in Role Playing Games). One of the fun aspects of any Dungeons and Dragons adventure can be the puzzle. It gives the Dungeon master a chance to test his players mentally, and creates a good (typically) non combat encounter for the players to interact with. Sadly however most Games Masters do not understand how and when to use puzzles, and struggle with the concept of balance. So here are some tips and criteria to consider when adding a puzzle to your adventure. Firstly there are many types of puzzles. We have Riddles, room puzzles, physical puzzles, mental puzzles and more. A puzzle can be anything that challenges the players to “figure it out”. While puzzles can be fun and exciting they also have the potential to become overly frustrating or even derail an adventure. When choosing what kind of puzzle you need to make sure that it is one that fits with the types of player and characters that you are going to present it too. Having a puzzle where they have to move 300 pound boulders into place is not going to be well suited for a party with rogue and a low level cleric and wizard. In the same way presenting a difficult mental puzzle to a low intelligence Barbarian is going to be a poor fit. By the same light, if one of your players has an IQ of 140 (which would be like having an eighteen for a character) you can expect them to solve a Moderate math puzzle with ease but if the other three players only have an average IQ the same puzzle may be difficult for them. Dungeons and Dragons relies on theater of the mind. You should not assume that the players are imagining the same thing you are. Especially When it comes to a puzzle that is more than a verbal or written riddle. Due to this you must be descriptive when explaining what your players are encountering. Use handouts and drawings if possible so that they can look and see what their characters are seeing. Telling them that you see ten numbers a two, a four, a nine, a seventeen etc etc is going to be hard for them to keep track of and force them to write things down or ask you to repeat what they see multiple times. If you give them a handout showing those numbers it is much easier and clearer for them to understand. Also you must describe every needed detail. If you fail to mention to the players that the strange mosaic on the wall has tiles of red, green and blue, do not be surprised when they do not draw a parallel to the red, green and blue tapestries they passed in the hall way. Your descriptions of the puzzle should be detailed and accurate. How challenging should it be? Just because you may think a puzzle is easy, does not mean your players will find it so. Remember you have the answer staring you in the face, they do not. It is hard to determine how difficult the players will find a puzzle so you have to use a certain amount of judgment. 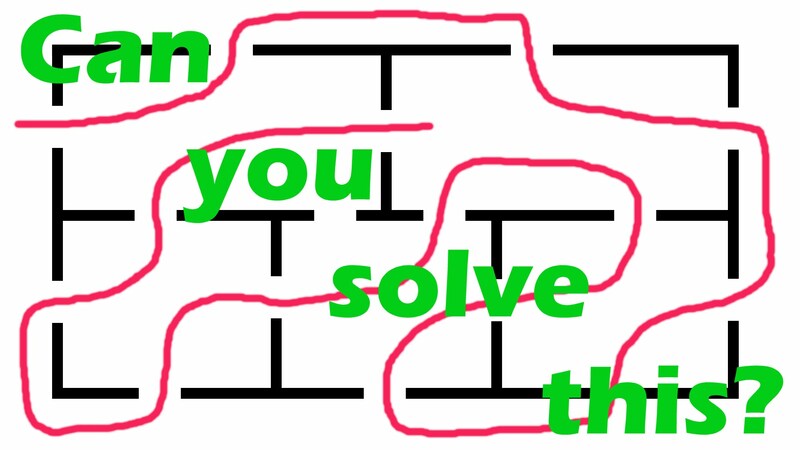 Where ever possible it is a good idea to have puzzles that can be figured out by trail and error. or make sure that there are some achievable clues that can help them if they seem to get stumped. On the whole it is better if the puzzle ends up being a little easier than you would have liked than being to difficult. Remember the players are not your adversaries. You are not here to BEAT the players, hell you can do that on a whim anytime you wish, You are the Dungeon Master! You are here to provide a great story and a fun experience. Its way more fun for a player to solve a puzzle in thirty seconds than be stuck pondering it for over thirty minutes. Remember that frustrated players are not having fun. Until you get a good grasp of what kinds of puzzles your players deal with best (and worst), air on the side of caution and assume it will be harder for them than you think. When and where to use a puzzle. One thing to think about is what will the reward for solving a puzzle be and what is the consequence for failing. If the puzzle is a room puzzle and the only way for the players to progress is by solving it, what happens if they don’t? If you make it essential for a puzzle to be solved in order for the adventure to succeed, you are gambling a hell of a lot on the players ability to solve your puzzle. I like to make puzzles optional. In other words there is no direct consequence for failing to solve it, however if they do they get a bonus reward. As an example, perhaps they see a side room that has a nice hoard of shiny things on the other side of it. To get their greedy little hands on the loot, they must solve a puzzle. If they do they are rewarded with the extra treasure, but if they fail or become frustrated, they can proceed without it directly impacting the story. On this note it is not a good idea to make acquiring a NEEDED item dependent on the solving of a puzzle, as once again you set up a scenario to possibly derail the adventure. Treat puzzles like extra content, but for the most part do not make it essential. Now If yo do decide to place a puzzle and make solving it essential, then it should be one that can be solved by trail and error or you should be prepared to afford them clues in some fashion as we mentioned earlier. At the very least the answer should be within their grasp and not totally dependent on what the players know or can fathom. Characters ability vs player ability. Another thing to consider is your players are probably not socially, physically and mentally the same as the characters they play. Robert himself may not be the sharpest tool in the shed but his wizard may have an intelligence of seventeen. Robert is confronted with a riddle and he sits there for fifteen minutes trying to figure it out but he just isn’t getting it. the odds are at this point Robert is stumped and is not going to figure it out. Now his wizard character on the other hand, who has seventeen intelligence, is considered to have superior mental ability. A person with average human intelligence (being around nine or ten or 100 IQ) may struggle a little with the riddle but would the wizard character? My usual method for dealing with this is to allow the player to roll on a stat if they wish, but if they do and fail I consider that final and do not allow them to continue to solve the puzzle themselves (unless some new circumstance should change the difficulty or provide a clue). Also I do not reward any experience points for solving it by resorting to a dice roll. If the player himself solves the riddle I always reward experience points for doing so. Sometimes I will start at a base value for the puzzle (say five hundred experience points) and then make some clues available to them. For each clue they use I deduct one hundred experience points of their potential reward so if they solve it but use three clues they only get two hundred of the possible five hundred experience points. using this method I give the players an out should they begin to get frustrated or simply can not solve the puzzle. The story should come first. Anyone that has seen me Dungeon Mastering live on Howreroll will know that I am often saying “If the Dungeon Master and the players always put the story first, it will be a successful and enjoyable game.” I want to examine that statement and go into detail about why it is important. Firstly the entire reason we really play Dungeons and Dragons, or any Role Playing Game is to have fun right? I understand that we do not all have the same exact criteria for experiencing fun, but for the most part if you have chosen to spend hours of your time playing a Role Playing Game, you probably have similar criteria as to what “fun” is as the other players AND the Dungeon Master that are at the table with you. To me the fun of running a Dungeons and Dragons game has never been pouring over rules, drawing maps, or creating interesting and complex encounters for my players, it has always been in telling the story, and watching my players embrace and interact with it. As the Dungeon Master your primary job is not to be an adjudicator or walking rules set, it is to tell the story. When we tell our story we do so in a different way than a typical author. We set the scene and describe it to our players in a way which sparks their imagination and allows them to visualize the world around them. With this mental picture painted we proceed to lead our players through a series of encounters that make up an adventure, and a series of adventures that make up a campaign. weeks, months or even years later, when the campaign has come to an end how do you look back on it? When we decide to run a game we as the Dungeon Master do a lot of prep work. We may write out our adventures (or read them if running a published adventure), create our encounters, draw our maps etc and then we sit down for our gaming session with our group of players. Yes this all has to be done but before doing any of these things begin by asking yourself “what is the story about?” define the tale you want to tell and depict the story first. Each adventure is like a chapter in a book, and the campaign is like the novel itself. You do not have to know the details of every single chapter when you first begin creating your story but you should know the general plot. When I create my campaigns I begin by creating my story. Before I go further I should point out I have two distinctive types of campaign that I run based on player experience and the type of game we want to play. I call these pre structured and non structured campaigns. My pre structured campaigns are the typical campaigns that most Dungeon Masters will run. They consist of an organized chain of events that have an ultimate goal or come to a specific climax. The other is where I allow the players total freedom and they decide on what they want to do at any given time. I offer no obvious adventure path but instead just allow them to explore a vast world and choose what to do. This method is very organic and requires a much higher degree of skill as a Dungeon Master. It is also ESSENTIAL that you have a well developed world at your disposal to even make this successful (see my world building series). I will cover campaign creation in depth in other topics but for now lets talk about it from a story aspect. I begin by writing the general plot synopsis for my campaign. for example. “Their is a vial cult that is working towards gathering the necessary items to conduct a powerful ritual that will allow a lost and dead chaos goddess to be reawakened and re enter the world.” It does not have to be too in depth at this point, its just the synopsis. Next I ask myself “how will the cult achieve this and where do the players fit in.” Well I decide that the cult will need to gather nine difficult and hard to acquire items and they do not wish to put themselves at risk of exposure or danger so they are going to find some lackeys to do it for them. This is where the players can come in. Now I have to look at the players motivations. Assuming they are not evil and happy to help bring the existence of a destructive goddess into the world, they are going to have to have a reason to do such a terrible thing. Promise of wealth is probably not going to do it, at least not if they find out what the items are for, so I want something more compelling. So lets have the players each get ambushed and marked with a powerful arcane mark that they can not remove by any means they try, and lets allow them to believe that if they do not find a way to remove the mark it will ultimately kill them. Now we have one of the evil cult members play the part of a helpful local herbalist who can set them on a path to possibly removing the arcane mark. By going through the thought process above I now have created the start to my story and also my campaign. Now I would write an adventure around the opening chapter of the story. I then continue with my story creating process and decide that the cult will literally dupe the players into gathering each item, and while the players believe they are doing it to rid themselves of the mark, they are in fact gathering all the needed items for the main protagonists of the story. Each adventure will deal with them gaining one of the items, and throughout the story I will drop very subtle little hints (that I know they wont pick up on at the time) about the true nature of what they are doing all the while knowing that when they get to the climactic end of the story/campaign the penny will drop and they will have a serious WTF moment. As I write each adventure I already know where it fits in the story. To bring the story to life I make sure to introduce several fun and memorable NPCs (Non Player Characters) for the players to interact with. Some interesting locations, villages, swamps, forests etc for them to explore and ultimately flesh out the details of the story. Finally I will put a lot of thought into the Final encounter of the campaign and by now I have a start and a finish and the details needed to create each adventure to fill in the middle. It is not necessary for me to create all the adventures of the campaign ahead of time, I can do so as play progresses. In fact I suggest you DON’T write to much initially as the players will most likely do things that will spawn ideas in your head that may be far better than what you came up with ahead of time. In the end you have created the basis for a great story, and now all you need is the main characters (the players) to help fill in the details as you go. Between you and your players you should end up with a story that you can look back on and say “Wow that would have made a great movie or novel.” These are the campaigns that will stick in your memory for years to come. Incidentally, you just read how I came up with the Marks of Intrigue Campaign. The first campaign I ran on Howreroll. If you would like to see how it played out you can check it out on our youtube channel.